Societal tastes and styles are in constant flux. The same holds true for the appeal of hotel furniture. As the years slip into the ether, the way people use and interact with furniture changes. And because FF&E is such a critical component to guest experience, hoteliers must keep those expensive case goods relevant. That can be a seriously expensive proposition. Fortunately, companies like The Refinishing Touch specialize in reimagining furniture in ways that reinvents pieces to make them more functional, durable and unique. Here’s some creative ways to keep furniture fresh. If your hotel still has bulky and unseemly armoires in guestrooms there’s no excuse to keep them any longer. Early on, The Refinishing Touch championed ways to convert armoires so quickly and easily, rooms are put back in service the very same day. We’ll remove the top section, refinish and add a stone or glass top to complete the new look. Sometimes pieces need to be reconfigured; sometimes they need to be entirely reinvented. The Refinishing Touch has myriad solutions enabling us to create factory fresh looking pieces by changing color, adding stone, laminate or glass elements, and changing the hardware, to name a few options. Today’s new furniture includes more technology, such as LED lighting, data ports, USB charging stations and concealed outlets. 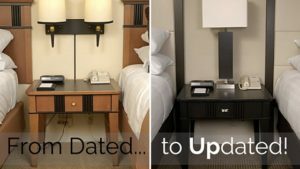 Rather than buy all new furniture, more hoteliers are finding they can reengineer and refinish their existing furniture to add those critical bits of technology that have become standard guest requests. Perhaps your existing pieces have a design flaw that was initially overlooked. One example, a chair was improperly engineered for a major hotel. It constantly hit the edge of the desk, damaging an expensive looking piece of furniture resulting in negative guest experiences. The Refinishing Touch engineered an inexpensive solution with high quality result, eliminating the problem resulting in a crisp, clean look. Before you renovate and dispose of ‘outdated’ furniture, remember I can be reinvented and brought to like new condition saving you up to 80% compared to buying new. How frequently should you update your furniture? Let’s take hospitality as a benchmark. It’s a good example because it’s one of the core industries we specialize in, and its high furniture use means it tends to have well-structured furniture asset management processes. In hospitality we find the average furniture asset lifecycle is seven years, which means that hotels expect to keep furniture for seven years before planning to replace it. Seven years is a generalization – we have worked with hotel chains and brands with shorter review cycles of furniture assets, and a few with longer cycles – but it’s a guide for any institution or business that is managing substantial furniture assets. In short, furniture asset management, like any important business process, needs to be planned. We’ve previously covered elements of this, such as inventory management and talked about the ideal scenario of documenting date of acquisition, acquisition costs, composite materials, current condition and locations of existing furniture assets. Seven years is the average lifespan we’ve seen from working with more than 22,000 customers over 37 years, but it’s not a figure set in stone (or wood). Furthermore, with wise spending and good planning the lifecycle of valuable furniture assets can be doubled. To lengthen the lifecycle it’s important to recognize another best practice of furniture asset management, which is to invest in high-quality furniture. We sometimes see managers make furniture buying decisions based on the short-term thinking of ‘pay less now’. Poor-quality furniture has a short lifespan – it cannot be refinished or updated, and will simply end up in landfill after a few years. It’s a bad decision for the environment, and for the business. Buyers need to avoid sub-standard materials such as particleboard, chipboard or furniture which has low-quality ‘filling’ composite material. There are a number of options when it comes to updating furniture. Furniture asset management best practices include refinishing, re-upholstery and remanufacturing. We specialize in each of these, and have updated hundreds of thousands of furniture pieces, saving our customers up to 80 percent on expenditure, preserving their environmental impact and working on-site to reduce downtime. If you’d like to discuss the furniture asset management lifecycle in your industry, and how it can be lengthened to protect your investment in furniture assets, then please get in touch today. As a specialist in furniture asset management for the hospitality industry, we like to keep track of news of renovations, updates and plans from brands, hotel owners and franchisees. Since the downturn of 2008 the industry continues to gain momentum and we have seen a strong year-on-year demand for furniture asset management services. There are many reasons for this increase. If you’re one of our regular readers, then you will know that an increase in awareness of environmental impact has certainly driven sustainable objectives. Furniture asset management has become increasingly important to hotels as consumers and travelers become more ‘enviro-conscious’. There is also an undeniable fiscal impact, with furniture asset management frequently cutting budgets by up to 80 percent. Add to this blend the minimal downtime incurred by onsite work, and you quickly realize why so many organizations are turning to furniture asset management. One area that is less frequently talked about, but is also a driver of furniture asset management, is a genuine demand for good furniture. And we mean good furniture. High quality, well-crafted items with strong joints and solid construction. No squeaks, gives and certainly no particleboard, chipboard or other low-quality ‘filling’ composite material. Finding such good quality furniture can be a challenge in a time when many individuals seem to have developed a ‘throw away’ attitude to furniture. The ‘rip and replace’ mentality was never a good decision. It was always an environmental and financial black hole for businesses and organizations. Travelers expect high-quality furniture and it’s imperative that the furniture we all invest in is comfortable, well made, built to last and fit for purpose. Many brands choose to go a step further, and insist on buying from domestic suppliers. The USDA regulates the import of wood-based products, largely to prevent any disease, pest or environmental impact on the flora and fauna of the United States. But to us shipping new furniture from other parts of the globe adds unnecessary carbon footprint, costs and delays. We are strong proponents of buying furniture domestically from well-regarded suppliers, or at the very least knowing the source and the status of the wood assets we buy. This is about making a well-informed conscientious buying decision. We make no secret that we support and encourage buying domestic goods. It’s also about understanding the wood that your existing furniture is made of. We have refinished softwoods and hardwoods of all different types. It is our job to know what a piece of furniture is made of and how to enhance the natural beauty of wood. Do you know what wood furniture you have and how it can best be preserved? And before you buy from that untested source, are you clear on the wood? Do you know whether or not that the Peruvian Walnut is endangered? Or if that African Blackwood has a ‘near threatened’ status? And if you buy composite materials including particleboard and chipboard instead, then it may have a very short ‘room life’ before it ends up as landfill. Chances are your organization has already invested in high-quality wood furniture. Now you need to apply furniture asset management best practices to ensure that you are maximizing it. Please contact us today at marketing@thefinishingtouch.com to discuss your investment and how to protect it. 2015 is starting off strong for the hospitality industry. Average daily rates (ADR) continue to rise, occupancy is up by 1.8 percent and international travel is booming, contributing to local, regional and global economic growth. As a result February has seen several global brands sharing news of expansion, renovation and innovation. We’ve seen this first-hand with a strong demand from our hospitality clients for furniture asset management services including refinishing, remanufacturing and reupholstery. As well as sharing news of growth, global hotel brands are emphasizing, headlining even, a commitment to sustainability. Many hotel brands have been accused of ‘green lip service’ when it comes to announcements relating to sustainability initiatives but in the thousands of projects we have completed in the hospitality sector, we see an increasing commitment by hotels to genuinely understand the green impact of their activity. 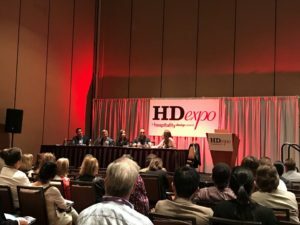 Hoteliers, brand owners and managers want to reduce carbon footprints, minimize the environmental impact of their industry, and stop unnecessarily landfill waste. For example, Starwood Hotels & Resorts Worldwide, a brand that The Refinishing Touch team has worked with for a number of years, announced that the expansion of its eco-friendly Element brand. This announcement certainly focused on the sustainability commitment of Starwood, with “eco-friendly” front and center in press releases and headlines. There was a very public pledge of green commitment made by Stefan Mühle, the new general manager of the Hilton Chicago/Oak Brook Hills Resort & Conference Center, who said he was determined to make the Hilton Chicago a ‘uniquely green destination’. Mühle knows a thing or two about implementing green programs as the co-founder of the Sustainability Committee for the Hotel Council of San Francisco. Across the Atlantic, the UK’s Battlesteads Hotel and Restaurant announced the addition of five new eco-lodges and a platinum-level rating in the TripAdvisor’s GreenLeaders Program. Each of these brands, general managers and hospitality specialists know that consumers are increasingly informed and conscious about environmental impact. Travelers look to TripAdvisor and other resources for green ratings prior to booking, they take advantage of in-room green initiatives such as linen re-use and energy conservation and want to see brands demonstrating a commitment to the environment. While a green approach can connect with travelers, increase business, and drive customer loyalty, sustainability initiatives frequently demonstrate fiscal responsibility. This is certainly true of furniture asset management where hoteliers consistently save 70 to 80 percent of budget while extending their assets’ lifespans and reducing downtime. Meanwhile, they lower harmful carbon emissions by a hundred-fold and eliminate unnecessary landfill waste. If you’re looking to boost the green rating of your hotel, get in touch with us today at sales@therefinishingtouch.com. In the hotel industry, Product Improvement Plans, Property Improvement Plans, or just plain PIPs, are a fact of life. PIPs are documents that detail the property upgrades and improvements mandated by a spe­cific brand, which must be met before a hotel is accepted as the required standard to become or remain a franchised property. As experts in furniture asset management across a number of industries including hospitality, we have written about PIPs many times. We’ve covered the opportunities presented to franchise owners when corporate brand owners mandate PIPs. We’ve also discussed some of the motivators, complications and business impacts of PIPs. We know from working with thousands of hotel owners and franchisees confronted by PIPs, that repurposing assets rather than buying new can play a significant role in meeting the required standards. Smart furniture asset management drives property projects with excellent ROI, customer satisfaction, environment credentials and overall value. At the last InterContinental Hotel Group’s Investors and Leadership Conference, our team connected with hospitality professionals on this topic. We networked with customers and partners and took the time to ask hundreds of owners and operators for their opinions on sustainability, furniture asset management and PIPs. We asked conference attendees if they were driven by cost or the need to be green when adhering to requirements mandated by PIPs. Around 98% told us that cost was their biggest driver, although almost half (45%) also wanted to demonstrate environmental responsibility when implementing PIPs. We fully understand the budget pressures put on owners and operators by mandatory PIPs. We also know from almost four decades of successful furniture asset management, that sustainable initiatives and financial benefits are not mutually exclusive. Well-written, considered and balanced PIPs take into account the combined advantages of increasing guest satisfaction, hitting budget targets, achieving healthy profits and developing new financial opportunities. Modern PIPs should also help owners and franchises to demonstrate their mutual commitment to sustainable initiatives. Meanwhile if you have any thoughts on PIPs or any questions about how furniture asset management can support PIP implementation, then please get in touch with us via email at info@therefinishingtouch.com. In previous posts we have shared our views on furniture asset management as environmental and fiscally responsible behavior. We discussed the need to maximize opportunities to reuse resources, minimize waste, and to take stock and understand the value of current furniture assets. Which brings us to one of the cornerstones of furniture asset management; inventory management. We help our customers to gain visibility and to track furnishings, fixtures and equipment as capital assets with our Global Furniture Asset Management, or GFAM, web-based asset management tool. If you’d like to hear more about this, please contact our team. Whichever system you use, it’s important to ensure that someone takes ownership of furniture inventory management. We typically find that this is managed by facilities management teams, but it’s important that the ownership is supported and encouraged by general management and also by finance. Furniture is a considerable investment for any college, hotel or government organization, and it’s important that it is tracked. Establishing an inventory management system for furniture starts with an active database. Note the highlight on the word active. We talk to many organizations keen to discuss how much they can save through furniture asset management that have outdated or non-existent databases of existing furniture assets. They aren’t sure what furniture they have, where it is or what condition it is in. The old adage ‘you can’t manage what you can’t measure’ is certainly true in furniture asset management. One obvious challenge of managing furniture is the ease with which pieces can be reconfigured and moved. This means it is important to track them and to have someone with an assigned responsibility to keep the database updated. Audits are essential. If your organization doesn’t have an updated database of its furniture, then you need to do a furniture audit. Map out, room-by-room and building-by-building, the furniture assets you have, where they are, what they are and their condition. Best practice involves associating the date and cost of acquisition, a practice which your finance team will appreciate. It shows how best furniture asset management practices such as refinishing, re-upholstery and remanufacturing can save up to 80 percent of budgets. When tracking furniture we consider location, condition and evaluation of existing assets as three key criteria that need to be consistently tracked. There’s no need to have a complicated system as this is about simple quality control measures that will determine where money has been spent, where it can be saved and how budgets can be protected. Finally, it’s important to consider the furniture asset management best practice of buying high-quality furniture in the first place. Increasingly we find that clients turn to us before they make new purchasing decisions, to ask us for our opinions of which product they should buy; which materials, which finish. We understand the importance of helping our clients to make a best value decision at the moment of purchase, to give then long-term investment protection. For more details of how we approach inventory management in the real world or to hear about our Global Furniture Asset Management (GFAM) tool, please contact us at marketing@thefinishingtouch.com. In our previous post we talked about how absurd it would be to buy a new car simply because your old car needs tires. Yet for many organizations with large furniture assets in hospitality, government, and education, that is exactly what happens. If you are running a hotel, a campus, or a barracks, you need to invest in furniture – and lots of it. This furniture needs to fulfil a purpose, be of a certain quality, be comfortable, and have longevity. In short, furniture is a considerable investment. The good news is that this furniture is an asset which can be protected. In the 37 years we have worked in furniture asset management, we have helped tens of thousands of hotels, colleges and government organizations to understand how to protect and manage these valuable assets. One challenge we face is to help organizations understand inventory tracking, one of the core principles of good furniture asset management. Back to our car analogy. It’s not that you want to throw your old car away because of the tires, you don’t even know how many tires your car has. Again, it sounds absurd but it’s frequently true. Consider the process of buying furniture. In some cases, furniture is bought as a series of piecemeal procurements, each with a value measured in hundreds of dollars. Yet these combined assets add up. In the case of the US government it adds up to millions of dollars across agencies and departments, and billions of dollars overall. Without structured information on how this money is spent with details of how many furniture assets were bought, where they are, what they are made of, the opportunities to reuse resources and avoid waste are missed. As the old adage goes: ‘you can’t manage what you can’t measure’. So as a first step, you need to consider how to approach inventory tracking of furniture assets. Next week we’re going to be detailing some of the best practices when it comes to the inventory management of furniture, as we continue to share our insights on best practice furniture asset management. Meanwhile, if you have any questions on furniture asset management best practices, please contact our team at marketing@therefinishingtouch.com.